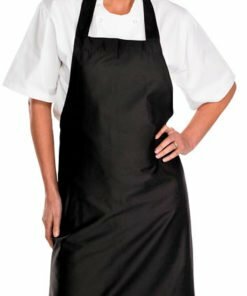 Our selection of aprons are ideal for those working in the food and catering industry. Perfect for chefs, cooks, butchers, waiters, waitresses, people working on food counters and in food prep areas. 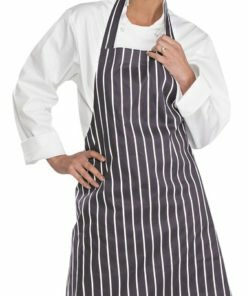 Choose from a half apron with pocket or a full length bib apron. Available in black, white or striped. Our aprons are excellent quality and are manufactured to last. 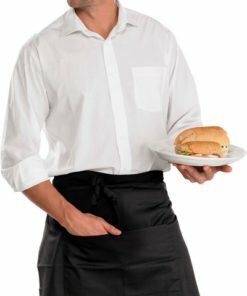 They are an essential addition to your work attire if you work in the catering industry. Aprons protect your clothes from food and liquid spillages, as well as general dirt and grime. We all know how messing it can get working in a kitchen, so wear an apron! Part of our collection of quality workwear. So if you require an apron for work then look no further. Need any help with your order? Then feel free to contact us on 0330 0885 675 and we’ll be happy to assist.